Bonjour (hello) from Montreal, Quebec! Nuns’ Island (officially Ile des Souers) is an island in the St. Lawrence River that is an extension of the city of Montreal. Beautiful, large trees, round roadways (they have round a-bouts like in England) and many charming, newly built town homes and apartments line the streets. Of course many of the residential buildings face the water which makes you feel so far away from the city- but only a 10 minute drive. One of the most fascinating things to see on Nuns’ Island is a gas station designed in the late 1960’s, which was recently turned into an outdoor community centre. 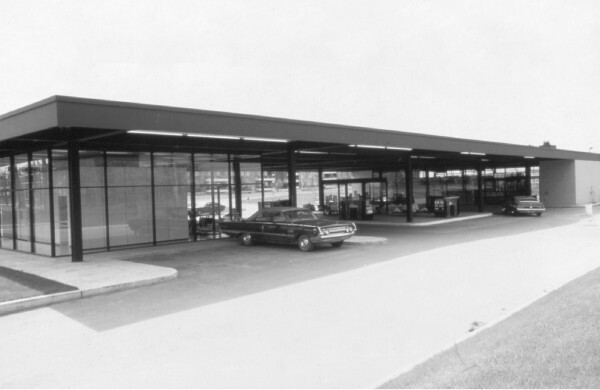 The Nun’s Island gas station is a modernist-style filling station designed by Ludwig Mies van der Rohe in 1969, one of four buildings by Mies in Nuns’ Island. It is no longer a working gas station and as of March 2012, went into the process of being converted to a community centre. The City of Montreal (and the borough of Verdun) is transforming the building into a community arts centre. Eric Gauthier is the lead architect on the project, which will see the two glass pavilions rebuilt to their original 3,000- and 1,000-square-foot sizes and will become a community centre for teens and people over 50 years of age. The two main buildings have been dubbed the “sale blanche” (white room) and “sale noire” (black room), after their floor colours in each area. The original glass-enclosed attendant’s booth will serve as a life-sized display case of Mies’ and the building’s history, with the former fuel dispensers to be marked by ventilation shafts. Here is the centre today; such a great way to preserve history & design while giving back to the community. Currently there is a lot of road work and construction around the new community centre but awe still strikes all who walk or drive by to see it. I hope you enjoyed learning about this small slice of design history from Nuns’ Island. Please feel free to post this to your Facebook or Twitter page (there are buttons below) and I would also ask you to Subscribe to my blog by pressing the link below. I look forward to more design history blogs coming soon! Cheers, K.